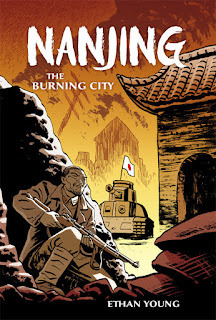 MILWAUKIE, OR— This past weekend, the National Cartoonists Society awarded the Reuben for Best Graphic Novel to Ethan Young for Nanjing: The Burning City, a brutal portrayal of a dark part of World War II history. “To receive the Silver Reuben has been such a proud moment for me. I was up against amazing competition, all published by Dark Horse Comics, so to have Nanjing: The Burning City selected truly humbles me. I hope my future work can continue to live up to the same standards,” remarked Young. More about Nanjing: The Burning City: After the bombs fell, the Imperial Japanese Army seized the Chinese capital of Nanjing. Now screams echo off the rubble as two abandoned Chinese soldiers—trapped and desperately outnumbered inside the walled city—try to escape. What they’ll encounter will haunt them. But in the face of horror, they’ll learn that resistance and bravery cannot be destroyed. Ethan Young’s next graphic novel, The Battles of Bridget Lee: Invasion of Farfall, debuts in September. Young also won a 2007 Independent Publisher Book Awards Gold Medal for the graphic novel Tails. The National Cartoonists Society is the world’s largest and most prestigious organization of professional cartoonists. Today, the NCS membership roster includes over 500 of the world’s major cartoonists, working in many branches of the profession, including newspaper comic strips and panels, comic books, editorial cartoons, animation, gag cartoons, greeting cards, advertising, magazine and book illustration, and more. Congratulations to all winners and nominees! Ethan Young is a prolific illustrator. His main expertise is sequential art and cartooning. Whether it's comic books or storyboards, Ethan Young brings his own unique sense of style and storytelling to every panel. Young has contributed comic book art to Dark Horse Comics, Image Comics, DNA Creative, Ardden Entertainment, Hermes Press, and Johnson & Johnson. He has also drawn and designed for advertising, video games, independent films, T-shirt designs, album covers, logos, fantasy & sci-fi illustration and much more. Young is currently the lead storyboard artist for 'The Centsables', a saturday morning cartoon on Fox Business Channel. The author lives in Ithaca, N.Y..